Shaders use GLSL (OpenGL Shading Language), a special OpenGL Shading Language with syntax similar to C. GLSL is executed directly by the graphics pipeline. There are two types of shaders: Vertex Shaders and Fragment (Pixel) Shaders. Vertex Shaders transform shape positions into 3D drawing coordinates. Fragment Shaders compute the renderings of a shape's colors and other attributes. As you may remember from the basic theory article, a vertex is a point in a 3D coordinate system. Vertices may, and usually do, have additional properties. The 3D coordinate system defines space and the vertices help define shapes in that space. A shader is essentially a function required to draw something on the screen. Shaders run on a GPU (graphics processing unit), which is optimized for such operations. Using a GPU to deal with shaders offloads some of the number crunching from the CPU. This allows the CPU to focus its processing power on other tasks, like executing code. Vertex shaders manipulate coordinates in a 3D space and are called once per vertex. The purpose of the vertex shader is to set up the gl_Position variable — this is a special, global, and built-in GLSL variable. gl_Position is used to store the position of the current vertex. The void main() function is a standard way of defining the gl_Position variable. Everything inside void main() will be executed by the vertex shader. A vertex shader yields a variable containing how to project a vertex's position in 3D space onto a 2D screen. Fragment (or texture) shaders define RGBA (red, blue, green, alpha) colors for each pixel being processed — a single fragment shader is called once per pixel. The purpose of the fragment shader is to set up the gl_FragColor variable. gl_FragColor is a built-in GLSL variable like gl_Position. The calculations result in a variable containing the information about the RGBA color. Let's build a simple demo to explain those shaders in action. Be sure to read Three.js tutorial first to grasp the concept of the scene, its objects, and materials. Note: Remember that you don't have to use Three.js or any other library to write your shaders — pure WebGL (Web Graphics Library) is more than enough. We've used Three.js here to make the background code a lot simpler and clearer to understand, so you can just focus on the shader code. Three.js and other 3D libraries abstract a lot of things for you — if you wanted to create such an example in raw WebGL, you'd have to write a lot of extra code to actually make it work. Make sure you are using a modern browser with good WebGL support, such as the latest Firefox or Chrome. Create a directory to store your experiments in. Save a copy of the latest minimized Three.js library inside your directory. Here's the HTML structure we will use. The first one will contain the vertex shader. The second one will contain the fragment shader. Before reading on, copy this code to a new text file and save it in your working directory as index.html. We'll create a scene featuring a simple cube in this file to explain how the shaders work. Instead of creating everything from scratch we can reuse the Building up a basic demo with Three.js source code of the cube. Most of the components like the renderer, camera, and lights will stay the same, but instead of the basic material we will set the cube's color and position using shaders. The resulting gl_Position is calculated by multiplying the model-view and the projection matrices by each vector to get the final vertex position, in each case. Note: You can learn more about model, view, and projection transformations from the vertex processing paragraph, and you can also check out the links at the end of this article to learn more about it. Both projectionMatrix and modelViewMatrix are provided by Three.js and the vector is passed with the new 3D position, which results in the original cube moving 10 units along the x axis and 5 units along the z axis, translated via a shader. We can ignore the fourth parameter and leave it with the default 1.0 value; this is used to manipulate the clipping of the vertex position in the 3D space, but we don't need in our case. This will set an RGBA color to recreate the current light blue one — the first three float values (ranging from 0.0 to 1.0) represent the red, green, and blue channels while the fourth one is the alpha transparency (ranging from 0.0 — fully transparent — to 1.0 — fully opaque). This shader material takes the code from the scripts and applies it to the object the material is assigned to. 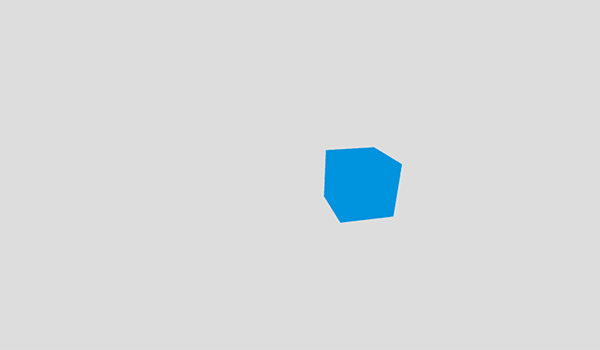 It looks exactly the same as the Three.js cube demo but the slightly different position and the same blue color are both achieved using the shader. This article has taught the very basics of shaders. Our example doesn't do much but there are many more cool things you can do with shaders — check out some really cool ones on ShaderToy for inspiration and to learn from their sources.